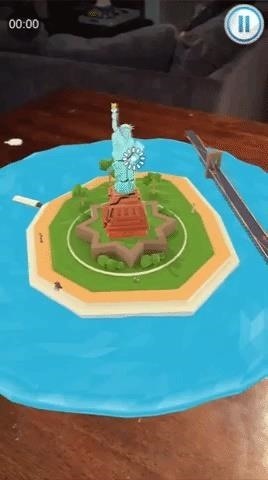 Last week, I tried out StackAR, a puzzle app updated to support ARKit where the AR features felt mostly unnecessary. On the other hand, PuzzlAR: World Tour, available on the App Store for $2.99, demonstrates how a puzzle game should be played in AR. The objective of the game is to reconstruct exploded models of famous monuments rendered in a whimsical art style. Each monument represents a level, and each level is unlocked through achievements such as finishing puzzles within a certain time, assembling puzzles divided into greater numbers of pieces, or discovering tokens hidden within the landscape. Players start with the Statue of Liberty and continue on to the Taj Mahal and the Sistine Chapel, with additional content forthcoming. 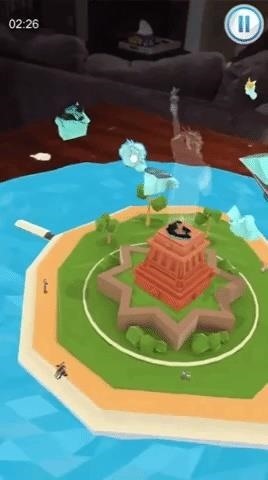 Developed by Bica Studios, the game actually originated as a free game on the Windows Store for HoloLens; it maintains certain UI features, such as a gaze cursor, from its HoloLens version, substituting hand gestures for touchscreen gestures in other places. Initially, I found the interface slightly confusing, but the controls became more natural as I adapted to working in three dimensions. 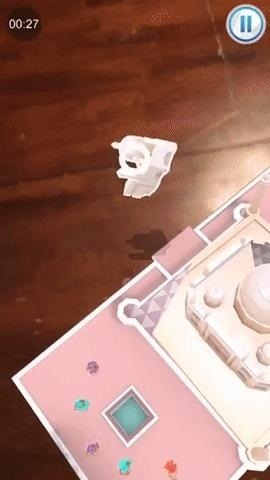 Moving the device and the camera's view allows players to move puzzle pieces throughout the space, while gaze and touch controls allow for selection and orientation of the pieces. 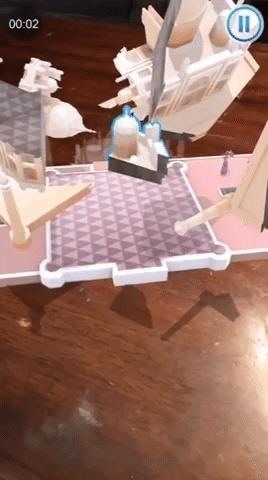 In essence, the interface emulates the actions of picking up pieces that are floating in space, with the phone being an extension of your hand as well as the augmented window to the puzzle. The gameplay and achievement system allows for an easy learning curve while still presenting a challenge. For instance, the game gives players a slight assist, as pieces pop into place once they are close enough to their destination. Nonetheless, I still haven't unlocked the 30 second time achievement for the 12 piece version of the Taj Majal, so I can't move on the Sistine Chapel yet. I do look forward to the flourish of digital fireworks that will greet me when I do, though. The price tag might seem to be a tad high for just three puzzles, but escalating achievements for each monument and the promise of additional content, as well as gameplay that actually justifies the AR experience, are worth the cost.